On 27 July 2018 at the launch of GLOBAL PEACE, the President of the Republic of South Africa, H.E. Cyril Ramaphosa, together with the Chair of ACCORD’s Board of Trustees, Mrs Graça Machel, officially unveiled the logo of GLOBAL PEACE. 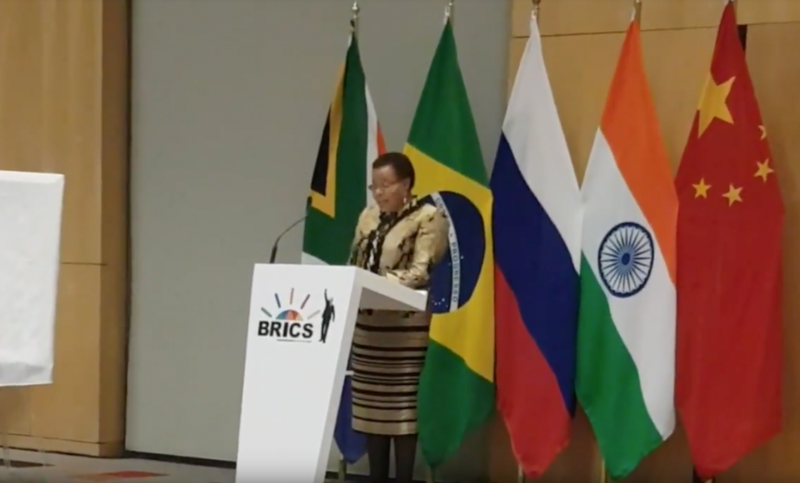 The unveiling was done at the lunch that President Ramaphosa hosted for the twenty two Heads of State and Government and their delegations attending the BRICS Outreach Summit in Johannesburg, South Africa. GLOBAL PEACE is an initiative of ACCORD and focuses on bridging the gap between peace and development. The logo for GLOBAL PEACE is modeled on the Adinkra symbol of the Mpatapo Knot, originating in West Africa, and is a symbol that represents the bond or knot that binds disputing parties to a peaceful and harmonious reconciliation. Excellencies, Heads of State and Governments, present here today, let me humbly thank you for giving me the opportunity to share with you ACCORD’s new initiative, GLOBAL PEACE. Excellencies, twenty five years ago, when we established ACCORD, we wanted to create a platform for African solutions to one of Africa’s challenges. We are proud to report that today ACCORD is one of the leading conflict management organisations in the world, working closely with the United Nations, the African Union, and our own governments, civil society, and private sector, shaping an African destiny with African solutions. Today Excellencies, we are taking our experience from Africa and the Global South, to extend our solidarity across the world through Global Peace, to build a new partnership for global and local solutions to our common challenges. We have consulted widely in Africa and beyond, and today we offer our partnership to you and your people, so that based on our shared values, we build inclusive societies and economies for human progress. Excellencies, today, as we are sitting here, the first generation to have been born in the twenty first century are turning eighteen years old and they are getting ready to vote for the first time in countries around the world. This twenty first century generation is getting ready to elect their leaders, and we must be mindful that those public servants whom they elect will be presiding over a world with complex new challenges as well as unimaginable possibilities. These complex new challenges will be driven by among other things, exponential population growth, rapid urbanisation, climate change, and work displacement which will increasingly put rising numbers of people in close proximity to each other and competing over scarce resources, which include education, healthcare, jobs, housing, and social security. Those nations that are unable to meet the expectations and demands of their growing populations will see increased poverty, unemployment, and inequality and continuous cycles of conflict. Social and political unrest and civil war will characterise the landscape of these countries. Terrorism, trafficking of weapons, drug trafficking, human trafficking, illegal migration and internal displacement of victims of conflict, will be the consequences, leading to the loss of life and destruction of much needed infrastructure. Excellencies, the challenge we face across the world today is to create the conditions for human security, economic prosperity and social cohesion. Our work in managing protracted political and social conflict throughout Africa, over the last twenty five years, has taught us that working towards peace alone will not deliver security or economic prosperity. Peace, together with governance, and development, that meaningfully impacts on the lives and livelihoods of people, will ensure sustainable peace and stability. Excellencies, today while we confront all these challenges and look for solutions, huge changes are taking place in the world that present us with new possibilities. Breakthroughs in science and technology through the intersection of quantum computing, artificial intelligence, and genetic engineering will provide innovators and social entrepreneurs with new opportunities and tools to contribute to transforming institutions and models of security, development, and governance. In addition, while the world is seeing growing inequality, driven by centuries of profit-making for the sake of profit-making, today there is a growing number of philanthropists and private corporations across the world who are willing to invest their wealth and profit into social enterprises that make a difference to people’s lives. Excellencies, today with these changing trends the Global South has a unique opportunity to transform how nations drive development in a different way. Our new initiative, Global Peace, seeks to take advantage of these emerging trends. We have found that too often the community of people who work on peace, governance, and development do not collaborate or work together. They also do not work with innovators like scientists, engineers, architects, city planners, and the many other creative citizens who use their skills to generate innovative solutions to human challenges. This Global Peace initiative will be our contribution to bridging the gap between innovators, influencers, investors and implementers. Global Peace will provide a neutral platform to broker peace and facilitate development. Using technology and networking, Global Peace will identify cities and rural communities who have developmental challenges, and link them to people across the world who have innovative and implementable solutions, and connect social investors who have resources to support these innovations with implementers who can produce tangible solutions. Global Peace will promote this ecosystem to complement the efforts of governments and multi-lateral agencies; strengthening national ownership and multi-lateralism. Excellencies, 2018 is the year in which we celebrate the centenary of the birth of Albertina Sisulu and Nelson Mandela; both of whom dedicated their lives to freedom and peace. This Global Peace initiative gives life to their legacy. Excellencies, we have chosen an ancient Adinkra symbol for peacebuilding from West Africa as the logo for Global Peace. It is therefore with a sense of deep gratitude, that in the presence of representatives of over fifty percent of the population on this planet, I officially launch Global Peace. May I respectfully call upon His Excellency, President Cyril Ramaphosa to unveil the Global Peace logo.